Free Gait Analysis, 365 days a year! Often injured? Not sure what shoe is right for you? Want to get fit for the perfect shoe and look at running shoes differently than ever before? We pride ourselves on customer service, expertise in our field, and providing the most in-depth running/walking shoe fitting available. Stop in, no appointment is necessary. Choosing the perfect shoe can be a daunting task. Let us take the guess work out of it and help you find the "perfect ride for any stride!" At The Sneaker Factory we look to provide you with the perfect fit for every run, race, walk, and workout. Having been in business since 1978, we have been able to develop our own fitting philosophy when it comes to the products we carry. How do we go about finding the perfect ride for your stride? Enter "Factory Fit." Using knowledge of the products we carry, human bodies mechanics, proper form, injury prevention techniques, and a fun form analysis program (isn't technology great) we are able to get you fit in the right shoe... and it won't cost you a dime or take more any longer than the time it takes you to run a mile! 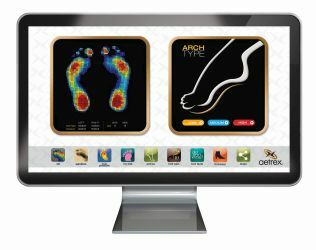 We will start with taking a high def scan of your foot, which will show us size/width/arch type/pronation/ and more! We will always measure your foot. 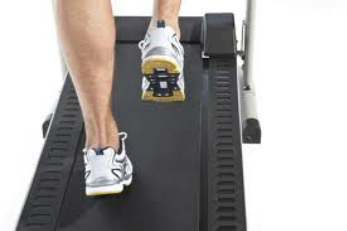 We will analyze your gait using a few simple steps. We will test your arch flexibility. We will take into account if you have a history of shin splints or plantar pain (or whatever nagging injury you have). We will take into consideration what you are training for. The Factory Fit covers all things running and walking. Think of this process as nothing more than a conversation about your running that will make your feet smile... mile after mile! What do you need to bring? The only essential is your feet... and we assume you bring them with you everywhere you go (aching plantar, blisters, achilles pain and all). It is always helpful if you have your current/old running shoes with you so we can look at the shoes wear patterns and really learn how the shoe worked for you. Bring us a list of what nags and aches when you run (long or short list is acceptable... we have all been injured). Forgot your socks... no worries we have fresh try-on socks for you to use. What is the process going to cost and how long will it take? All we ask is that you bring your feet and an open mind... we want to find the right shoe for you and we won't charge you a dime! The process can be as simple as running (or walking) through a few simple steps or could take up to 15+ minutes if the injury woe's have gotten hold of you. No worries, we are fully staffed and ready to take care of you! What can you expect? We promise to take as much time as necessary to find the perfect fitting shoe for your every training need. Whether your goal is to win the state championship in the mile, finish your first 5k, qualify for Boston, or to finally walk pain free... we have the shoe for you!